We love RV camping as much as you do! That’s why we love to write things about what will make our recreational vehicle even better. A part of it, we recognize the importance of showerheads that can offer us with shower convenience while away from home. But, what is the best RV shower head? 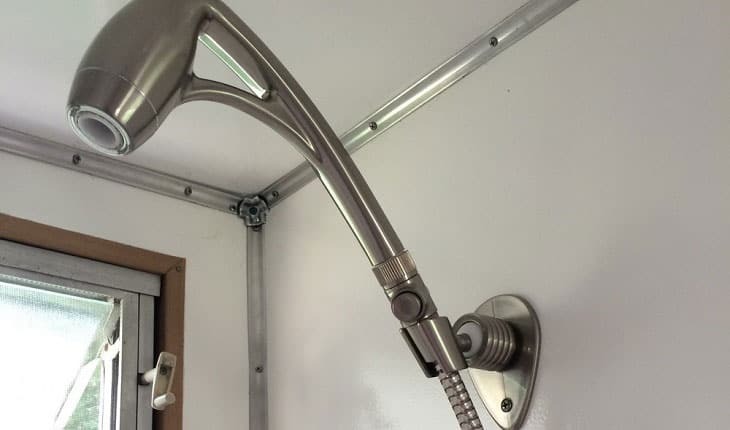 To dress up your RV shower and make it cozier than it is, you need to install a great showerhead. But we know it is not easy to select from a saturated market filled with great choices. For this reason, we have tested and tried the best RV showerheads right now and came up with this review to help you select the best one for your needs and preferences. Also in this guide, we’re discussing some points on what to look for when buying one. Let’s begin. Whether or not you have a dry camping adventure, there is no need to fret if you have the Oxygenics Showerhead ETL 26781. We think that this is one of the best showerheads we’ve tested for this review. Our team loves that fact that this shower fixture can make every RVer’s life more enjoyable and fun while camping. All you need is to fill up your motorhome’s reserve tank, turn on the water heater and wait until water warms before showering. We find this showerhead valuable for putting engine power into our motorhome, not to mention it looks attractive and blends well with any decoration and theme. Another benefit we love about this choice is its ability of increasing oxygen content into the water, allowing for self-pressurizing for that jet of comfortable shower all the time. If you’re looking for a non-clogging showerhead, then you might consider this fixture. We find its control ability amazing, giving us the option of adjusting water pressure from soft to stimulating. And when buying a showerhead kit, you must also look for one that comes with complete accessories. 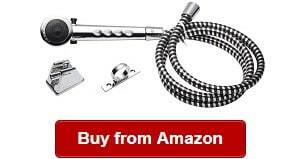 Just as what you’d see in many Oxygenics RV shower head reviews, most users love that it comes with a wand holder and hose, washers, comfort regulator, manual and Teflon tape. We just love that the manufacturer didn’t give us a hard time of installing this showerhead because it includes complete accessories. We think that the ETL 26781 is one of the best buys out there because it is also backed with a lifetime warranty. 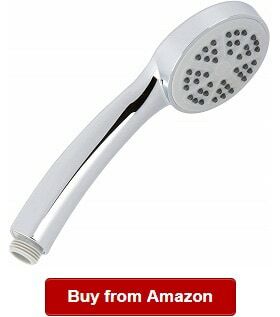 This alone can give any consumer peace of mind when buying a showerhead. This can also help us save water for its 2.0 GPM and adjustable pressure. And as it is handheld, it is very easy to use even by kids. One problem we find is its lack of water pressure compared to other products. If you’re looking for a durable and high quality showerhead, then you might want to check out the Dura Faucet. It is one of the coolest choices we can recommend. For one Dura Faucet is a reliable brand with commitment to quality and customer satisfaction. This model is also compatible for many types of recreational vehicles, campers and fifth wheels. RV camping must be very comfortable and convenient so that you can feel that you never really leave your home. We think that this Dura Faucet is one of those to provide us with that. This item is made of lightweight synthetic resins that add to its stylish look and durability. 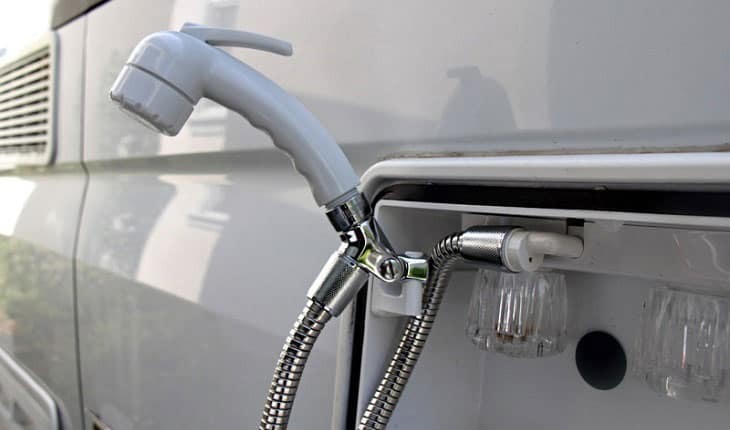 When motorhome camping, we also recognize the need for saving water. Every drop counts to avoid the inconvenience of running out of water supply if there is no hookup in the camping ground. This model can help us save water because of its trickle valve switch, which allows moderate water flow. But remember, it is not an on and off switch. Regarding ease of use, we find it one of the best choices because of the 60-inch hose included. It is a standard that the Dura Faucet has kept in the item that we find useful. The DF SA130 WT also comes with a mounting bracket, allowing for easy setting up and installation. Flow rate is also higher than other products at 2.2 gallons per minute and 60 PSI. We find it better than with other products offering only up to 2.0 GPM. For peace of mind, we think that it also pays off to choose a UPC & CUPC Certified product, and this DF SA130 WT is. One problem we dislike is its synthetic resin materials, which might not be as durable as other materials. We recognize the importance of having a comfortable shower experience in RV camping. This item is promising for its ease of use and convenience with its pause settings. It lets users control and save water especially when there is no hookup available in the camping ground. With the PIH showerhead, you never have to have a communal shower experience and share with other campers. You can have it in your motorhome, fifth wheel or RV. And this showerhead can offer you with a comfortable shower experience all the time for its powerful shower spray. It can also save water for its controllable water intensity settings. It can also provide a high-pressure water flow, meaning you don’t need to take a long time to shower. We also find it valuable for its completeness coming with a 59-inch hose, Teflon tape, hose clock and mounting bracket, making installation a breeze. We love that it comes with alternative and multiple functions. It can be used in many types of recreational vehicles and campers. We also believe that families will love its flexibility, coming with a long enough hose for providing that ease of use especially for children. For beginners, they will not find it hard to set it up because the PIH showerhead comes with an easy to understand manual instruction. You won’t need someone to install it for you with that. Regarding versatility, this product can be adjusted in three settings, namely the pause, pulse massage and powerful shooting. It can provide us with that comfortable shower experience all the time. We believe, however that its pause function could be improved by the manufacturer because it might break over time with frequent use. 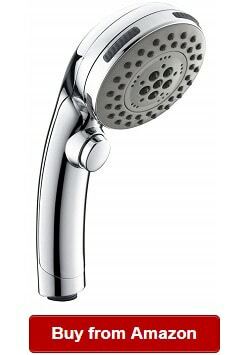 Just like the Oxygenics fury RV shower head, we also love this 26481 showerhead for the benefits we’ll get from it. 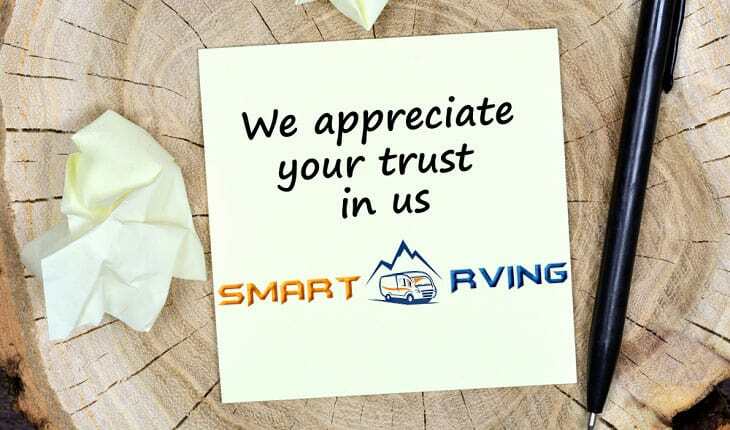 For one, it is by a top brand known for its years of presence and commitment in the RV accessories world. We believe that this model is worth your spending because it is powerful and compact. It has this technology of turning a low water pressure into a luxurious and strong spray. 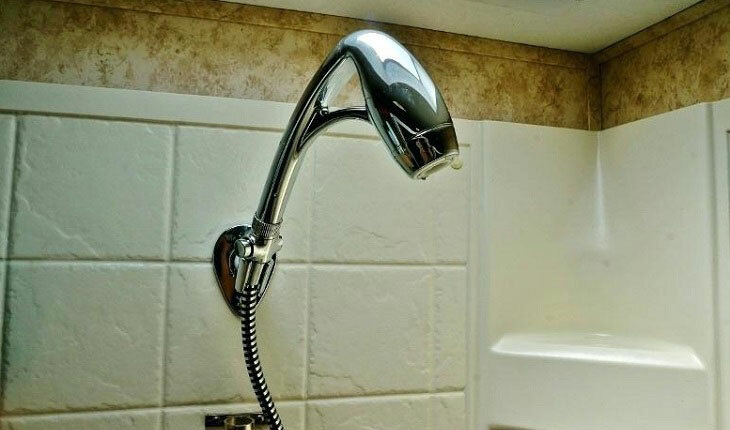 So even if you have this water pressure in your RV, you won’t find it hard to use this shower fixture. It is one of the most powerful choices we have found while scouring online for the best showerheads for RVs. The 26481 Oxygenics model also lets us save water versus traditional showers do. With that said, we can conserve water ion our tank, making it last longer especially for long camping trips. We also believe it is a great buy because it comes with a Smart Pause valve, which can give us that navy shower fast! This item is also made of top edge materials, making it durable and long lasting. With that said, we don’t need to replace the showerhead from time to time. It does not also clog, no matter how high the water pressure is. This benefit makes this product a cool choice because we can have peace of mind with it. The durable materials also ensure protection from failure. Who does not want that? If you have long hair, it can also reduce the time spent in showering for its spray pattern that helps in washing and rinsing hair faster. Before we forget, we also love its ability of amplifying pressure while saving water level. This item is also designed for maximum performance with pressure limits and tank size. One downside is its wall mount holder that might break over time with daily and frequent use. 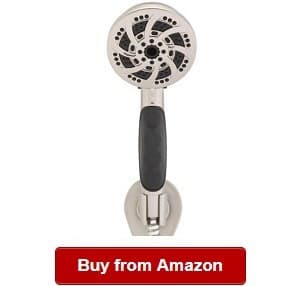 Regardless you’re shopping around for best RV shower head replacement or new installation, you might want to give this product a second look. The Oxygenics ETL 26181 is one of the best choices this year when it comes to RV camping accessories and shower fixtures for its high quality and durable materials. The handheld showerhead is easy to use, providing you with a luxurious shower experience all the time. For one, we find the self-pressurizing function advantageous because it is able to save water while also cutting shower time. Even if you have long hair, you will find this 2.0 GPM showerhead convenient to use for its precise shooting spray, which makes every wash and rinse easy and quick. In the RV camping ground where there is no water supply hookup available, you don’t have to worry! 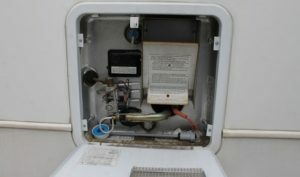 You can just fill your RV’s water tank and heat the water for an hour or so. Then, you can take a great shower with this showerhead, putting engine power into your RV shower. No matter the kind of water pressure you want, you don’t need to fret! You can adjust the level of comfort you want from soft to stimulating with the showerhead. In that case, we find that the item can help us conserve water in the tank. That’s something we appreciate knowing that it’s hard to be away from home camping without water supply. One problem is its plastic materials that have the tendency of breaking over time. If you’re completing your RV accessories or trying to replace an existing showerhead, you might want to give the Camco 43712 a look. It is convenient to use for the on and off switch that makes water conservation also possible. With it, you can reduce the amount of water to use because it can “pause” water while you’re shampooing. When finding a new showerhead, you must also look for one that is easy to clean. This product has rubber spray tips that make cleaning a breeze. It is also compatible for use and easy to install in boats and RVs, making it one of the top choices we love in RV showerheads. We also love that the Camco 43712 offers five spray patterns, allowing us to choose settings, including a pulse massage or a drenching rain experience. This item also has a good size of 4 inches diameter and a total length of 9 inches. You won’t even notice it is there! We appreciate that it also has a great design that matches any shower decoration and theme. With it, you don’t have to change any existing decoration in your shower. Overall, we love this product and believe that it is the versatile and durable choice in the category. You might want to check it out yourself. One downside we find in this product is the on and off switch might be weak to withstand constant use. You might not have to figure out between Ecocamel vs Oxygenics if you would opt for this Aqua Elegante showerhead model. If you’re looking for a high-pressure variety, we recommend this product for you! It is made with high quality and durable materials for use in years. 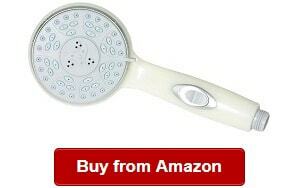 It is also removable and handheld, offering you with much ease of use every shower time. Plus, one exciting fact we love about it is its nozzles totaling to 36, giving you that blast and high-pressure water supply. Although has the ability of amplifying water pressure, this product offers you water savings. It can reduce shower time and minimize water use. We also appreciate that it has a removable water regulator that can let you increase gallon per minute supply. This offers us a huge advantage because it allows for better control that we cannot find in other products. One innovative function we also love about it is its self-cleaning nozzles that can solve hard water. We know you can also appreciate it. There is also no problem with installation because all you have to do is to twist it on. That said, you don’t need to hire a plumber to install it for you. Plus, if you need more help, you can also read the easy to follow instructions on the manual. However, know that it is not the wall mounted version in case you’re looking for one. On the downside, this item does not come with a shower bracket or a hose. That said, you should buy these parts yourself before installing it. The item also comes with 5-year warranty, which we think must be longer. When trying to compare Oxygenics fury vs. Body spa, you can help yourself by knowing what you need to find out about this Fury model. We think that it is one of the most convenient and flexible choices on the market for its durable and high quality design. Speaking of design, it has the cozy and elegant built that complements most decoration themes. We also recommend this product for its ability of infusing oxygen to the water. How does that help? With this function, you can be sure that each drop will expand and increase power. What does that mean? It only translates to reduced water use in the five settings coming with this showerhead. It can also make you feel as if you’re home because it can provide you with comfortable shower. And with it, you don’t also have to share shower with other people. The flow control lever is another thing we love about this item, allowing us to use trickle flow while shampooing hair. This product comes with high quality components for preventing corrosion and clogging. These two are something that none of us would appreciate because they would affect the performance of our showerheads. But with this product, you don’t have to worry about corrosion and clogging anymore. The Fury RV handheld shower is made even more dependable for the five spray settings, allowing us to choose the level of comfort we’re looking for while showering. It won’t also slip because of its rubber tips for keeping a tight grip and preventing slipping. This product is also certified for 2.0 GPM for cost savings on water and energy use. One problem with it is its shut off feature that might stop working over time. 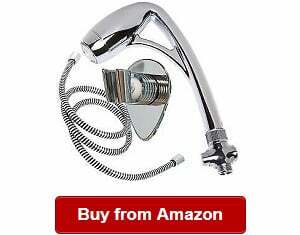 Dura Faucet is a staple name in showerheads because of its quality and reliable products like the Dura Faucet handheld showerhead trickle. It is chosen and used by RVers, travelers and motorhome owners. 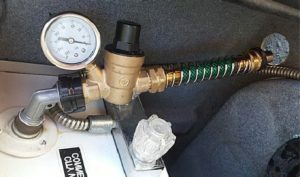 If you’re looking to feel as if you’re just home, then you might want to take a look at this model that can supply you with precise and consistent water pressure you desire. We appreciate that this shower trickle is also designed with the users in mind. It has a wand design that allows easy gripping as well as quick access for control of the valve switch. And with that, we can be sure that it will use less water while providing us with just the sufficient water pressure needed. This Dura Faucet showerhead trickle is also made with durable materials, such as its stainless steel hose, ensuring its long years of service. Stainless steel is rustproof and can resist corrosion. The complete kit is also lead-free, ensuring safety of the whole family. We appreciate that the maker also has beginners in mind. This product is very easy to install. That’s something we appreciate about this item that does not require hiring a plumber to do the job. We can install it in minutes! And for any problem, you can reach out to their USA-based customer support that we find helpful especially when we need answers to our questions and concerns. One problem though is its trickle valve that can be improved further. It has the tendency of breaking with daily and frequent use. 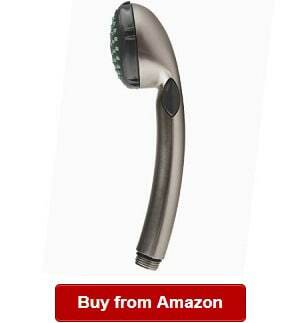 Just like the reliability to find in an Oxygenics shower head, the HOMELODY handheld showerhead is also a great choice for its smart features. It is designed and made with on and off pause switch that lets you stop water flow when needed. Main reason is that we all love saving water when RV camping. None of us would like to find out that we ran out of water supply especially if there is no hookup available in the campsite. We don’t have to worry about it though with the high-pressure handheld showerhead that lets us save water, too. For one, it lets saving water with just a push of a button, which also gives us the ability of stopping the water flow. We also appreciate that it won’t need for its middle to close the switch valve when we need to adjust or control the water temperature, something useful for the disabled, adult, baby, toddler and campers. The showerhead also offers five different settings, giving us the ability of controlling water flow while also saving water with the high-pressure but minimized water use that this item can give. We also appreciate that it has a Chrome finish because we think it looks modern and elegant. It can match any shower decoration because it is a neutral color that can blend well with any other colors. This product comes with a 10-year warranty, giving us peace of mind with the purchase. With it, we can be certain that help is within our reach when something goes wrong with the showerhead. On the downside, it does not include a shower hose, so you will still have to buy it for yourself. You should trust our team when choosing the best showerhead for your RV because we’ve carefully considered the things to look for, including ease of installation and performance. By factoring into the most important considerations, we’re able to pick the top picks that RV owners can rely on. By trusting our team, you can be certain that you can shop for the showerhead that suits your preferences, budget and style. With us, you can also rest assured that we’ve only picked the top rated and highly reviewed products in the category, too. We do believe that reviewing the best showerheads for the RV can also help you compare and weigh your options better. A recreational vehicle showerhead is just like the traditional showerheads to find at home. It’s a bathroom or plumbing fixture used in directing water spray in a shower. Most of them offer full flow and fantastic shower experience just like in a spa. They also make use of energy and water saving technologies. Showerheads for a camper or RV also come in different types, including single spray, handheld and dual showerheads, to name a few. 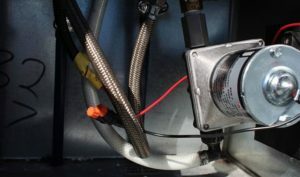 To help you understand further, check out the following section for the different types of motorhome showerheads. The RV shower head works in a simple manner. Its main purpose is to provide a water mist or spray to the person taking a shower. It works by facilitating bathing through changing the water stream coming out of a bathroom faucet. So instead of a messy, hard jet of water flowing in an undisciplined stream, the showerhead diffuses the water, offering a more comfortable water stream, which spreads in a larger surface area. There are many models and types that offer further adjustments based on your preference. The showerhead also results to a larger water pressure, preserving water. However, some of them need maintenance especially rubber types that might need cleaning because its flow of water rate can decrease due to the buildup of minerals, including lime scale. It can be cleaned through using liquids, such as magnesium. But for those without rubber, they don’t require soaking to cleaning liquids. There are different types of showerheads to choose from, which make choosing one a bit difficult. We put up the following to help you determine the different types of RV showerheads. It usually comes with an adjustable nozzle, allowing you to change the water pattern without any hassle. It is also less expensive than other types of showerheads are, but it can be costlier depending on their finish. Nevertheless, this spray is basic and very simple to use. It is a recent type introduced on the market usually having flat and large spray that spread equal water amount over a large surface area. It can also reduce the water amount that hits the user’s body. Many look elegant and stylish, giving your bathroom that fresh, new look. One can offer users with excellent flexibility because it can be detached from the wall. It also includes a long hose, allowing users to wash and rinse even hard to reach body areas. Water can stream from more than one place with this type of showerhead, but it is usually controlled by only one lever. In some cases, one unit can include a diverter valve, letting users operate only a shower each time. 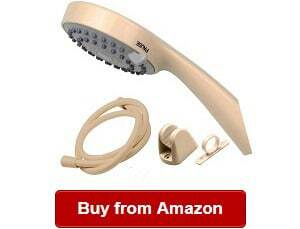 This type of showerhead is also convenient and easy to use without any hassle. When shopping around for a showerhead, you should consider some factors to help you pick the right one. In the following, let us discuss some things to look for when buying an RV showerhead. Showerheads are for sale at different price ranges, mostly dependent on the finish and materials of the item. Be sure to first figure out how much you’re willing to spend on this investment. 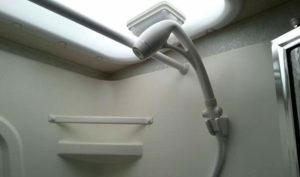 In most cases, you don’t have to shell out a big amount of money to buy and install one in your RV shower. We don’t want something that will give us a headache in the installation process. That is why you should look for one that comes with an instruction manual. In addition, find a product that can let you set up the showerhead in minutes. Many models also are good at this because you can simply twist them on, and you’re done. That said, you don’t also have to hire a plumbing technician to set it up for you. Whether you’re buying an Oxygenics or an Ecocamel RV shower head, you should look into the product’s performance. Regarding it, find one that can offer enough water flow for rinsing your body thoroughly while also letting you save water. Performance also has to do with its ability of letting you control water pressure. Nevertheless, you should spend some time in researching on the performance of the showerhead models that can offer enough water flow. It must also be able to provide you with lesser time to spend in the shower. A good one can also let you adjust water pressure according to your comfort preference. When finding a good quality showerhead, you should also look for one that has a great style and finish. There are models coming with a chrome finish that looks cozy and elegant to install and use in any bathroom with any concept and design. When it comes to durability, you should be checking on the construction of the showerhead. Or else, you might have to replace yours more often than not. Also, cheap plastic ones might not be able to last for a long time. So aside from finding a stylish showerhead, you should also find one that is made of high quality and durable materials, such as stainless steel hose. This material is rustproof and corrosion-free, making your showerhead long lasting and durable for years to come. Nevertheless, you should pick a durable product to prevent frequent replacements. 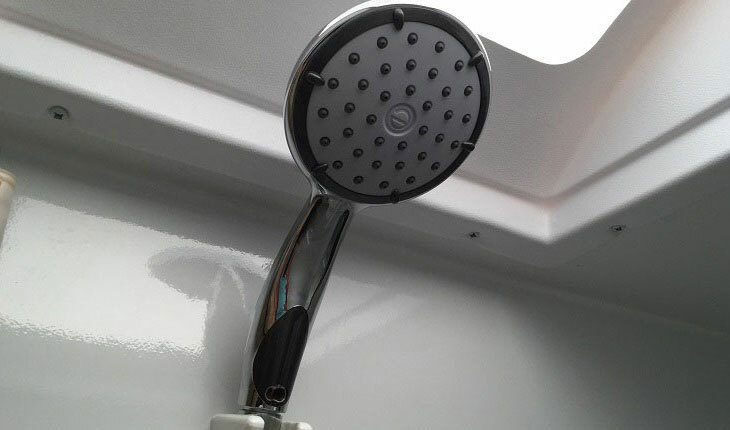 An old RV low flow shower head will sometimes feel as sharp needles on your skin, but you don’t have to worry about that if you buy newer models. These showerheads can let you adjust and modify the flow settings from soft to stimulating. They can also come with different water patterns for letting you select and use the type of pattern you desire. Newer showerheads can also offer water adjustments between 1.5 and 2.0 GPM. They also meet the qualifications of Water Sense. On the other hand, there are also showerheads that can offer gentle to hard sizzles depending on your needs. Some of them can also provide you with a gentle and pulsating massage with their different spray settings. Regarding efficiency, you can look into the product’s ability of producing enough water flow, giving you the comfortable shower each time. Generally, showerheads can provide a maximum of 2.5 gallons per minute. This figure is lesser versus older models before. But if you’re looking for more water savings, you might want to look for those that have maximum 2.0 GPM. 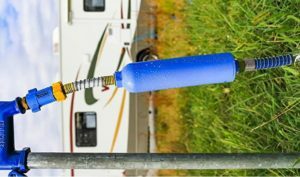 This will help you conserve water tank level and prevent running out of water while RV camping. Check if it is handheld or not. 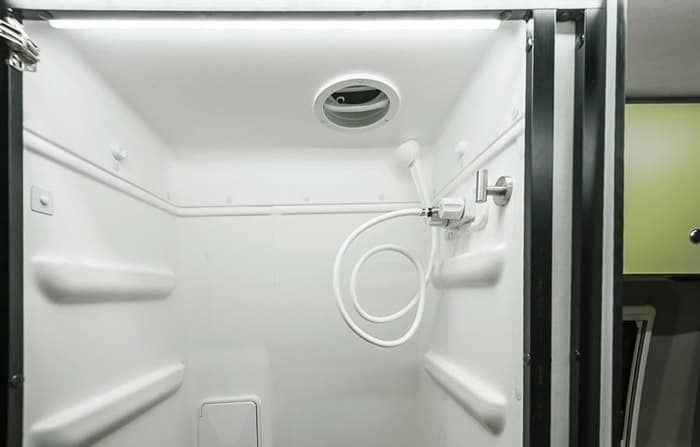 As shower areas in recreational vehicles are limited in space, you must opt for one that has a handheld design. It will help you reach all body parts regardless how small your RV is. Overall, you might also think about the overall design of the showerhead and consider buying a handheld one for more flexibility. We have touched on this a while ago in this RV shower head review, and it is also one of the most important factors to check when finding the best showerheads. Look for its GPM rating; a lower one means it is better is saving water. For the best results, you might want to select one that can offer a max of 2.0 GPM. There are many benefits of installing a showerhead into your RV bathroom. Check out the following for some of their major advantages. As it cuts down water usage, it also helps in cutting down energy consumption in heating the water. So on heating costs, RV owners can expect to cut down on it significantly. The best ones like low-flow showerheads can reduce water consumption for at least 40%. It does not only reduce consumption but also translates to more money savings annually. Because there is also reduced water demand, there’s also lower energy amount used, resulting to a lower carbon dioxide the air. So if you’d like to reduce CO2 emissions, you might want to consider a new showerhead for your RV. The best showerhead offers more convenience to the users because they’re able to experience comfort right at their RV just as what they do at home. They can also have a soothing massage to their tight muscles with the smooth sizzle coming out of the showerhead. New showerheads operate more efficiently than older models do because they can deliver just the right feeling of convenience with their settings. RV showerheads also offer more value because they can offer just the enough water flow to rinse your body, saving water, too. As they also allow setting the water pressure based on your preference, they indeed are better when it comes to performance versus older models are. Top of the line showerheads can provide ease of use and comfort to the user because they can be used easily even with your hands soapy. They are also easy to install. A good design gives a lasting good impression. With the wide range of styles and designs, you can choose one that matches your RV bathroom or shower’s decoration. It is another criterion when picking an RV showerhead, ensuring it can last long and give you more value of your investment. Q: What are good RV shower head brands? A: Fortunately, the competition makes showerhead brands more committed to the quality, function and durability of their products. A few of them we commend include Oxygenics, Camco, HOMELODY, Dura Faucet, Aqua Elegante and PIH. These are a few of our favorites and we’re sure fellow RVers would agree. Q: Is the hose flexible? 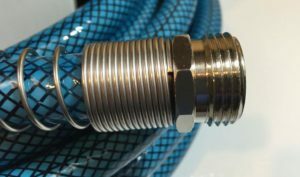 A: Yes, those that include a hose in every kit usually has a flexible hose. Such feature can help you wash and rinse even hard to reach body parts. 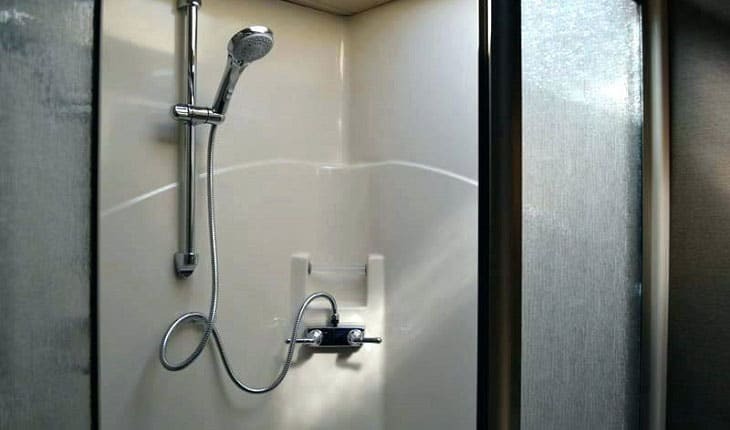 It is also ideal even for smaller shower spaces in an RV. Q: Do RV shower heads save water? A: Yes, they can! For example, the high quality RV shower head can offer adjustment settings for water pressure, allowing you to change or alter it depending on the comfort level you desire. High efficiency models are also rated at 2.0 gallons per minute. Users can also save up to 50 percent more water through their high-pressure showerheads. Q: Handheld showerheads vs regular shower heads: Which is better for you? A: Handheld showerheads are the better option because they allow flexibility. They are also easier to use than regular showerheads are. Handheld types also let users easily reach all body parts without any hassle. Q: What does GPM or PSI of RV shower head mean? A: Most products we’ve featured here are Oxygenics certified. They’re at great PSI and GPM ratings. But what do these two acronyms mean? PSI means pounds per square inch. It is what measures water pressure. On the other hand, GPM or gallons per minute are what measure the washer’s water flow rate. They say that the higher the PSI and the lower the GPM is the better choice. Q: Can I have a high pressure water flow even when the pressure is low? A: Yes, you can. In fact, those products we have featured here are designed and made to address this concern. Q: Should I buy a high pressure RV shower head or regular? A: You must buy an RV shower head with a high-pressure if you are looking to save as much as 50 percent of water than the regular ones. High-pressure models can also help in reducing the time you spend in the shower by up to 50 percent. Q: How to install (replace) RV shower head? A: It is so easy! In general, you just have to twist it on and you’re done. But then again, you have to check on the maker’s instruction manual and follow it closely for specific directions. There you have certain things to look for when buying an RV showerhead. Again, check on the durability, ease of use, price, and gallons per minute, performance, efficiency and adjustments when choosing one. From all these, determine the features you want for the showerhead to buy, compare your options well and pick the product that meets your needs and specifications. Finally, start with your search using our list of recommended showerheads, including on a RV shower head with on/off switch. 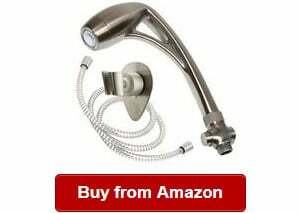 Hope you picked up something from this guide on the best RV shower head to come up with a sound decision when buying yours today! If you are looking for other RV freshwater system products, you should read these articles: best RV tankless water heaters, best RV water filters, best RV water pressure regulators, best RV water hoses, best RV water pumps and best RV water softeners. We do hope you like them. Thanks!